Late afternoon fairly busy with most folk seated, we stood at the bar until a table became vacant in the right side bar. Many years since my last visit and pleased to see no obvious changes dare I say it. Late morning visit while the pub was still quiet. 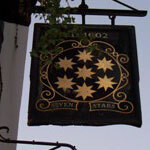 I had a chat with Roxy who told me she had been at the helm of the Seven Stars for seventeen years. Harvey's - Sussex Best Bitter 4.00 Top quality pint. Evening visit, my first for yonks. I can see why the pub's cat in ruff, currently Peabody, gets customers talking. Unusually quiet, we sat and had a good chat with Roxy. Beer list as already entered by Michael Croxford. 14:45 Very quiet. 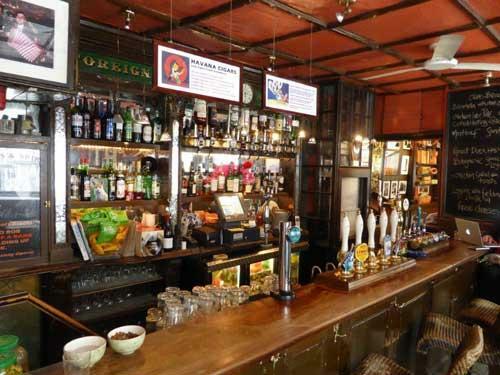 We sat and chatted to Roxy about various North London pubs. Evening visit and lots of different nationalities drinking in here tonight, it was nice to see Japanese, Italians and Americans all drinking cask ale. Fairly quiet during the afternoon. I had a chat with Roxy. Adnams - Southwold Bitter 3.70 A well kept pint. Early evening visit. We were honoured by a brush-past with pub cat Ray Brown, resplendent in his lawyers’ ruff. Look on the wall here for the charming framed poem by Tony Nash in honour of his predecessor Tom Paine. Sambrook's - Wandle 3.80 This pint a little past its prime. 16:30 Our party was spilt over three pubs and we re-met here. Heaving but we managed to get a seat. I didn't note all the beers. I had a very good porter but can't read my notes of the brewery name. A couple of hours hard grind around the Courtauld Gallery had worked up a thirst, which was dealt with here. Always an interesting crowd in. The young couple on the next table were comparing notes on which of their respective families were the bigger Yorkshire landowners. Dark Star - Hophead (some, if not most, also brewed by Fuller's) 3.80 People say Hophead is not what it was. This tasted pretty fine to me. The pub is found in Aldwych, Central London, WC2A 2JB. 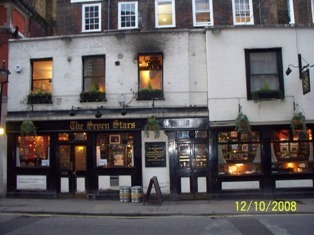 Located in Carey Street right behind the Royal Courts of Justice this is a smallish pub split into 3 rooms. The main bar isn't very wide with rooms for eating/drinking at either end. It has a good feel to it and is somewhere you can imagine losing an afternoon. Beware the steep flight of stairs up to the toilets. 5 handpumps. We have visited this pub 15 times, seen 16 different beers and tried 8 of them.